Many companies claim to have the solution for email overload, but few deliver. That's why I was wary of Mailstrom, a (currently) free service that promises to deliver the elusive "inbox zero"—a state of being so far out of my reach, I'm not even sure what it means. But after testing Mailstrom, I was pleasantly surprised at just how close I came to achieving that sought-after state. Mailstrom works with any IMAP email account. All you have to do is you enter your email address and it goes to work, analyzing your account. I sat back and waited while it "loaded" my account—and it didn't take too long, considering that the account holds more than 22,000 messages. Once the loading process is complete, you head over to your Web-based dashboard to see Mailstrom's analysis of your account. 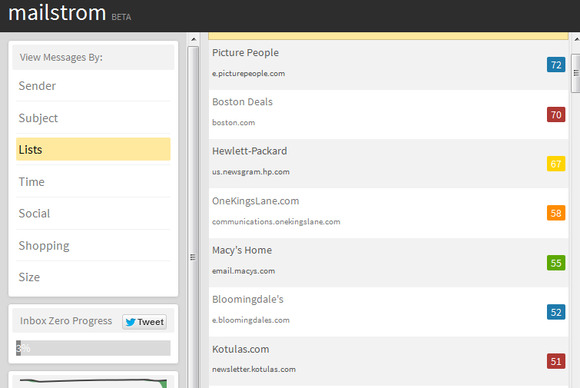 Mailstrom lets you browse the contents of your inbox by sender, subject, and more. Mailstrom displays a very detailed analysis of your email, showing you messages by sender, subject, time, and size, as well as those from certain mailing lists and social networks. Under each category, you can browse the most common traits…and it can be eye-opening to see who sends you the most messages and what subject lines are commonly used. Mailstrom uses a three-column view that's similar to Outlook: The first column shows the categories, while the second column shows more detail on the selected category, and the third column lets you see lists of messages or the content of a specific one. But that's all it does, and at first, I wasn't sure what to think. Many of the email clean-up services I've tried, such as Sanebox and Unroll.me, do more work for you, sorting your bulk mail into folders that you can scan when you want to peruse their contents. But that approach didn't work well for me, an admitted control freak. I found myself too concerned that I was missing out on important messages (which I sometimes was, as none of their sorting systems was perfect). 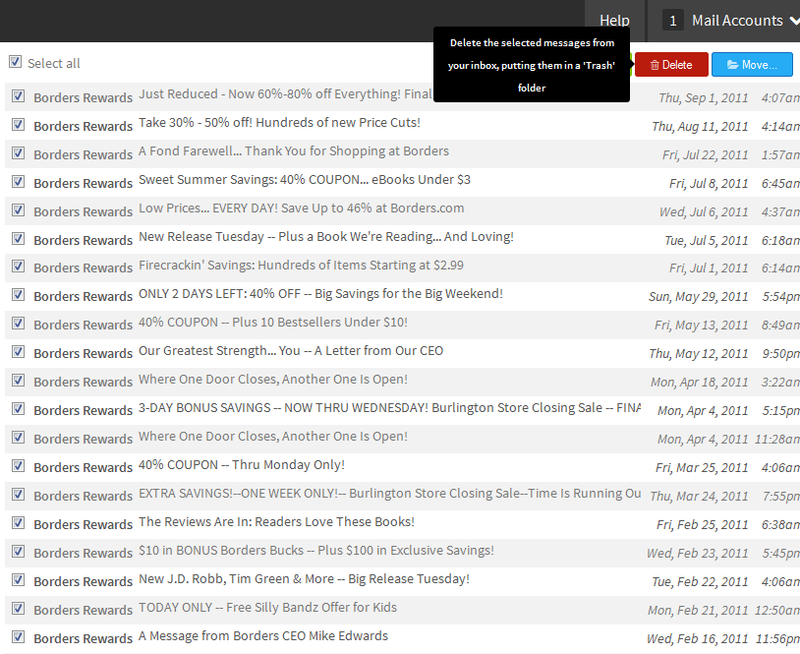 Mailstrom makes it easy to delete hundreds of emails with the click of a mouse. That's why I like Mailstrom so much: It leaves you in control. It shows you the problems with your inbox, and lets you solve them yourself. For example, when I realized that I was storing more than 1,000 messages from the very editor who assigned me this review, I realized I need to create a folder just for her—a task I was able to easily accomplish from within Mailstrom. When I saw that I had hundreds of messages from a bookstore that's no longer in business, I was able to delete them all in one fell swoop. The one feature Mailstrom is lacking is an unsubscribe option. It would be nice to see the hundreds of marketing messages I get, and then be able to unsubscribe from them instantly. Unroll.me does include an unsubscribe feature, but its filtering approach makes the service more able to make sure you no longer receive the messages you don't want. Mailstrom instead leaves you in control, and the benefits of that are worth the inconvenience of having to handle the unsubscribing yourself. 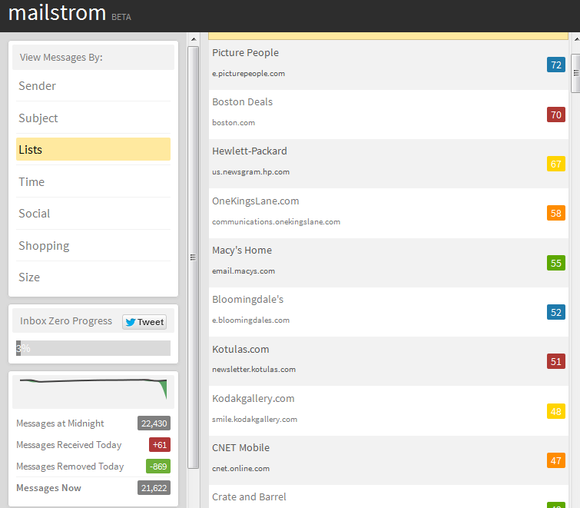 Mailstrom offers a handy way to look at the contents of your inbox, with an eye toward cleaning it up.